Click here to book an Edmonton hotel. The capital of Alberta, Edmonton, is known as the 'Gateway to the North' since it is a transportation hub and gateway to regions such as the Yukon and Northwest Territories. It began as an oil town, and is now Canada's oil capital, with 2200 oil wells within a 40 km (25 mi.) radius. This prosperous resource isn't the only thing drawing people to Edmonton, however. 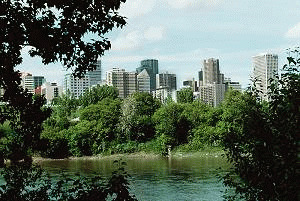 With more green space per capita than any other Canadian city, Edmonton is one of the prettiest prairie cities around! Stay in an Edmonton, Alberta accommodation, and enjoy all Edmonton has to offer. Known as the festival city, Edmonton is always buzzing with activity, with at least one festival occurring each month, including Canada's largest Fringe Festival. Perhaps the most popular attraction in Edmonton is the West Edmonton Mall, the largest shopping mall in the world with 7 major attractions. Edmonton has several professional sports teams, and is home to The University of Alberta, established in 1908 after Edmonton was declared the capital city. The decision to make Edmonton the capital caused uproar amongst Calgarians, and the friendly competition is still evident on a variety of levels today. Stay in Edmonton and cast your vote for the greatest city in Alberta! Our west Edmonton hotel is minutes from Valley Zoo and the West Edmonton Mall. All guest rooms include a 32-inch LCD flat-screen television, coffee maker, hair dryer, iron and ironing board. Drive-up rooms with patio door access are featured. Upgraded rooms also include a refrigerator and microwave. Free wireless high-speed Internet access. Our Edmonton hotel is located near the Alberta Aviation Museum. We offer an on-site restaurant and bar. Free Wi-Fi is provided. Each room offers a microwave, refrigerator, a flat-screen TV, a desk, and coffee-making facilities. A fitness center and sauna are available for guests to enjoy. We also provide vending machines. There is a snack menu available in the Lounge bar. Our Edmonton hotel has free WiFi and complimentary continental breakfast. All rooms provide a flat-screen HDTV with cable channels. Additional amenities include a microwave, fridge and coffee maker. 100% non smoking. On-site parking is included. 10.4 miles from Edmonton Valley Zoo and 11.7 miles from the University of Alberta. This Edmonton hotel features an indoor pool, jacuzzi and guest rooms with cable TV and free Wi-Fi. The hotel is 5 miles from Valley Zoo. Rooms offer free Wi-Fi and desks. They also provide coffee makers and ironing facilities. Guests have access to a gym and business center. The hotel offers an on-site CHOP restaurant, which serves steaks, fresh seafood and cocktails. Our cozy Edmonton bed and breakfast is located near West Edmonton Mall. Everyday, we serve our guests a continental breakfast. Guest rooms come with a Flat-screen TV and offer either a private bathroom or shared. All rooms are equipped with a work desk. Free Wi-Fi is provided. In the common area guests can use a shared microwave, fridge, and toaster. Hot chocolate, tea, and coffee are available. Our Edmonton West hotel has spacious room that combines comfort and functionality, including high-speed Internet access. Large desk with conveniently placed lighting and outlets and an ergonomic chair for comfort. 32" Flat panel HD TVs. Luxurious white bedding; duvet, crisp linens, fluffy pillows and individual climate control, windows that open. This modern Edmonton hotel has on-site dining, a fitness centre and a flat-screen satellite TV in every room. Matrix Hotel serves a continental breakfast and offers evening wine and cheese tastings. Guests can enjoy fine dining at Wildflower Grill and cocktails at MZ Lounge. Starbucks is also on site. A minibar, MP3-compatible CD player and free Wi-Fi are provided in the spacious, modern rooms. Our South Central Edmonton motel is walking distance to many amenities and local restaurants. All guest rooms are equipped with full cable television and air conditioning and offer complimentary coffee. Kitchenette rooms are also available for crew workers or long-term stays. Smoking and non-smoking rooms are available. Pet friendly (with fee). Our Edmonton hotel near West Edmonton Mall is just minutes from attractions like Royal Alberta Museum. Each non-smoking guest room at our newly-renovated Edmonton hotel includes a microwave, refrigerator and 32-inch flat-panel LCD TV. Enjoy a free continental breakfast and our fitness center and our indoor heated pool and hot tub. Free Wi-Fi Internet. Our South Side Edmonton hotel includes our free deluxe breakfast. Enjoy our indoor heated pool and whirlpool or book a meeting in one of two well appointed meeting rooms. Keep up your fitness routine in our Fitness Centre. All rooms include a refrigerator, microwave, wireless high-speed Internet and two phones with separate lines! Perfect for the business traveller. Valley Zoo is 11.9 km away and Highway 2 is minutes from this Edmonton hotel. The hotel features a 24-hour restaurant and guest rooms include cable TV and free Wi-Fi. Every room provides bright rooms with free local telephone calls. This Edmonton hotel includes a gym and on-site laundry facilities. Telus World of Science is 6.1 km away. Super 8 Edmonton is 14.7 km from John Jantzen Nature Center. Our hotel in Edmonton is located in the posh West End of the city, which is almost a city unto itself. Within just kilometers of our property, you'll find gorgeous neighborhoods, plenty of outdoor activities and shopping like you won't believe. The Hampton Inn & Suites by Hilton hotel in Edmonton West is conveniently located only minutes from the West Edmonton Mall. Ideally located in the heart of the downtown area, within walking distance from the Legislative Assembly of Alberta and the University of Alberta. This Edmonton hotel is minutes from the Shaw Conference Centre, Commonwealth Stadium, the Royal Alberta Museum and Rexall Place stadium, home of the NHL Edmonton Oilers. Savour the privacy and comfort of a spacious apartment at Canterra Suites, a handsome and secure Edmonton Hotel. Conduct your business from an office within your apartment suite or enjoy a family stay where everyone can have the privacy of a separate bedroom. At Canterra you may book daily stays or a long term stay customized to your particular needs. Our Edmonton hotel is on the University of Alberta Campus. We offer guests free Internet access. There is a restaurant located on site. Each guest room comes with a flat-screen cable TV, a work desk, and a private bathroom that includes free toiletries and a hair-dryer. Guests can find a mini-market and snack bar located on-site. Guests can relax in the beautiful garden. Our downtown Edmonton hotel boasts comfortable guest rooms that are 100% non-smoking. Our rooms' décor was professionally designed to please our valued guests. Our bathrooms feature a six-function multi-action Waterpik showerhead and SolTerre bath amenities. Each guest room features a coffee/tea maker, high-speed Internet, hairdryer, free local telephone calls, and more. Our Edmonton hotel affordable rates, award-winning housekeeping services, and comprehensive room packages, which include meal deals and room service. Pet-Friendly Atmosphere. Non-Smoking Facility. Choose from our hotel suites or standard rooms. Complimentary Continental Breakfast. Wi-Fi access in guestrooms and meeting rooms. Free parking. The Edmonton-West hotel is located just five minutes from the West Edmonton Mall. Guests enjoy perks like our free a.m. Kitchen Skillet breakfast, Free Wi-Fi everywhere and spacious rooms with home like amenities. Indoor swimming and fitness center. Our Edmonton bed and breakfast is located in the Gibbard Black of Edmonton's Historic Highlands. Our suites offer beautifully decorated rooms with a minibar, cable TV and a fridge. We provide free Wi-Fi. Select rooms come have a patio. Guests can enjoy on-site dining. French cuisine is offered at the La Boheme restaurant. A bar is also included providing an area for guests to sit back and relax.